Ok need a thread in this section anyway. Hey mech' heads out there. I wish to pull my D-1 apart and connect to its 100 wheel base a Def' body work. What will be the hardest route for the connection of the body to the chassis? I was thinking the outriggers is a good problem to start with, secondly comes the rear tub length. I was thinking getting 110 rea and shortening from behind the rear bulkhead as to keep the rear flares looking semi norm. Does anyone have this process down pat? This sounds like a worthy Project. If you do decide to attempt it, document the project from begining to end. I have no doubt any one of the four major LR mags would make it a feature. Mating the tub up to a Disco frame may not be so bad, as any mods are likely to be small, and not visable anyway. The bulkhead just needs outriggers in the right spot, side rails attach there and go back to the front of the tub, and seat box rests on top. My son and I picked up a '96 Disco with a very nice drivetrain (0 miles transmission and xfer case, low miles engine) but the body has 'issues'. I also have a '93 NAS 110, so making some observations and taking some measurements might not be that big of a deal, except for the 6" of new snow last night. There are some differences between SW 110 frames and pickup frames. Maybe a new 110 frame might solve enough problems to pay for itself? I get a kick out the term 'HiCap when those boxes are no bigger than that of an S10 or Ranger pickup, but I guess it's Hicap compared to a standard 109 or 110 tub. The Hicap box doesn't make the rear wall of the cab, so the box mounting points can float somewhat more than otherwise. Jeez, I love thinking about projects like these, more so when there's someone else to actually do the work. Last edited by TerryS; 12-27-2004 at 02:30 AM. If you haven't gotten your copy of the winter edition of The Rovers North News, get one, and go to the article on the bottom of page 20: "Go Ahead-Supersize Me" by Craig Reece. 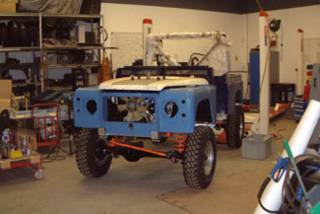 He describes his project, A D100, built on a Disco chassis, work done by Shane Ballensky, of Rover Hybrids. He has a website, http://www.roverhybrids.com. Sounds like what a D90 should have been, all along. Adam, my wife's always telling me to make it bigger...not smaller!!! I found this site today and when I saw this thread I had to throw in my .02 cents. I've had the D100 bug for quite a while and finally decided to build one. I've got a 94 Disco and an ex-MOD 2 door 110 so I've been measuring and comparing the two. Don't kid yourself about the complexity or difficulty of this project. I've been fabricating for a lot of years and it will be a lot of work. You'll need to remove the stock body mounts and out riggers from the Disco and shorten the aft end of the frame and install a rear crossmember. I haven't looked at the front frame horns yet but I'll bet they'll need to be shortened. Then look at the work needed to install the 110 tub. It'll need to have the front bulkhead removed, the side skins trimmed and the bulkhead reinstalled. Then do the same to the rear panels so it matches the rear crossmember. Then you've got to deal with all of the systems (fuel, electrical, etc). Guys I promise I'm not a know it all (too many of those in the world already) but I've been looking at this pretty intently for a couple of years. If my rant sounds discouraging all you need to do is look at the Roverhybrids website. The 100" wheelbase just looks right, and the company did a really nice job on it. I've spent enough time studying this project now it's time to act. A couple of weeks ago I bought a 95 Disco to use as a base and I know where a new 110 tub is. I used to own it, I was a dumbass to sell the thing. I definitely agree with TerryS, this project needs to be documented by everyone who builds one. I always learn something from others projects. Hopefully I'll be able to contribute something useful to this site. Even though I´m by no means technical by nature, I think this would be of use, because it was very detailed on the build, as well as being very entertaining! Hope it is of use! Mechanical genius Mark Evans dusts off his overalls and introduces his new project. A 1985 Range Rover that is to be converted to a one off 100” wheelbase hybrid; as a tribute to 25 special vehicles that Landrover built for the French and Swiss armies in the late seventies. First Mark cleans off the grime off his donor car & checks the health of the mechanical parts. Meanwhile, in the first of our regular features, “4x4 Extreme” sees an extreme hybrid V8 car in off-road terrain. 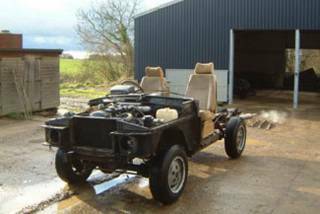 Mark buys the body panels, and sets about modifying the chassis to support it all, by welding in some new outriggers and quickly causing himself problems! Mark makes the brackets and plates to join the body and chassis to make the unique combination. All is not so simple, as the wheels do not go under the wheel arches!! Mark makes his own rear cross member, and with the aid of Paul Harris shows everything there is to know about MIG welding. Mark wants to assemble his aluminum tub, so will the help of Paul, he makes first steps in learning the art of TIG welding. “4x4 Extreme” takes us to an extreme Suzuki / Landrover hybrid, fitted with some Landrover suspension parts, and a 1600c Vitara engine. Mark ventures out of the workshop and introduces a new regular feature, looking at the fascinating history of Landrover, starting at the original series 1. 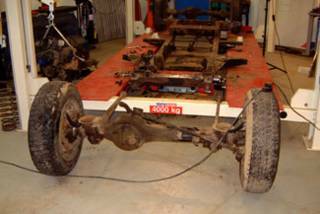 With the base chassis stripped, Mark shows how to assess and rebuild the transmission. He rebuilds the diffs, and shows how to incorporate air locks. More extreme Suzukis appear in 4x4 Extreme, and proves that even people who are too young to take their driving test can succeed in off road trials. Mark’s attention turns to the front axle. The History of Landrover focuses on the infamous series 2 and 3. Attention is turned to the monster V8! Cleaned, stripped of its ancillaries and decapitated, Mark assesses its condition. A unique V8 space frame Land Rover based offroader is put through its paces in “4x4 Extreme”. 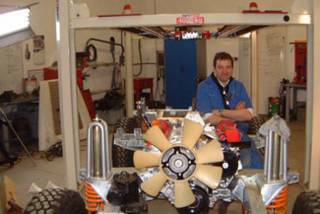 Mark visits a Land Rover Gearbox and transfer box specialist to find out how they work and what options are available for his project. Away from the oily bits, the chassis is cleaned and goes through the specialist Galvanizing treatment. Meanwhile, Landrover history looks at the biggest revolution for the legendary company: The Range Rover. The galvanized chassis arrives back at the workshop. When Mark has finished admiring it, he starts to build it up! First up: suspension!! Meanwhile “4x4 Extreme” introduces Rob Jones, a farmer who shows how practical a 4x4 really can be! Mark continues playing with bushes, trailing arms, and panhard rods, before experimenting with Springs and dampers. Mark makes himself a roll cage out of the longest piece of tube he could fit in his van, and shows you how to bend, assemble and fit it. “4x4 extreme” shows that offroading is not just for men: we meet a special lady who relishes driving her everyday car to the limits! The History of Landrover is brought up to date with more unique vehicles. Back in the workshop, Mark strips down and assess the internals of his V8. Is it as really as good as he first thought? Mark cleans his pistons, prepares and lubricates the crankshaft and engine block. Out of the workshop, we follow another extreme 4x4 trials driver, while Mark fits the pistons & rings into the bores. The camshaft & its followers assembled, followed by the heads!! Mark paints & sets the timing on his newly assembled engine. Meanwhile, Alan King shows his class 1 Range Rover Special, which is extensively modified. Featuring hydraulic steering amongst its many modifications, it can do some serious offroading. Back in the workshop, Mark fits his core plugs, before venturing to his bench to show how to correctly remove a broken stud. Attention is then turned to rebuilding the oil pump. Out of the workshop, Mark looks at a unique Range Rover, and then unites the newly fitted Clutch and gearbox to the engine. Mark then takes the strain as he fits the rebuilt running gear into the awaiting chassis. Mark fits and assembles the bulkhead to the chassis. The wiring transforms from a jumble of multicoloured spaghetti to the vital veins of the beast’s electrical system. Outside in the mud, we are introduced to a unique BMW powered special: “Rock Rod”. Mark also looks at a unique floating Landrover in “When Landrovers Go Mad”. While he out of his workshop, he visits a paint shop to prepare the body panels of his new beast, before turning his hand to the fine art of painting! The Landrover is starting to take shape, and attention is turned to the brakes, but Mark quickly runs into serious problems with the fuel tank filler. “4x4 Extreme” pays homage to a Daihatsu and a Range Rover hybrid proves a cheap and simple but effective extreme offroader. Returning to the workshop, Mark’s attention is now on the performance exhaust. “Land Rovers go mad” goes all celeb as we visit a very special vehicle that has been featured in the movies! Finally, Mark fits the ancillaries to the V8 engine. Can he get the monster to purr?? Attention now turns to assembling the body. 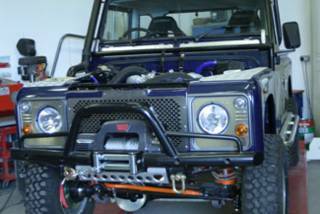 Before starting fitting and modifying the dashboard, we take a look at an extreme 4x4 Range Rover “bobtail”. The rear cab is next to receive attention in the workshop. With the project nearing completion, Mark throws off his overalls, and finds how to drive Landrovers off-road. Not wanting his unique vehicle to be stolen under his nose, Mark invests in some sophisticated Alarm systems. He also makes his own tailgate, fits a winch, side protection, and snorkel; and forgets his Wedding anniversary! A Defender features in “Extreme 4x4”, and Mark learns how to operate his new winch on an Off-road driving course. The specialty tailored seats are fitted, plus the last of the windows and door panels; plus Mark gets all scientific with his suspension & wheels. A V6 Ford Capri engine powers an extreme Landrover in “4x4 Extreme”, making it ideal as a starter vehicle. Mark learns more about driving off-road on side slope and in deep water to prepare him for the big day ahead, when he gets to drive his own Landrover... which is not far away! It has been a journey of blood, sweat and tears: Mark put the finishing touches to his special 100” Landrover, before bringing it outside into the Spring sunshine. Mark wants to see where he is going by fitting extra lights. Mark runs into a problem with his suspension while testing outside the workshop, but he decides to go out and test it where it was born for – Off-road! Thanks for the info. I read about that show in one of the LR mags but had forgotten about it. I'll try to track it down here in the US. I did a 97 Disco 5 speed 4L. chassis swap with my '62 serII 109 body. I added 10 inches to the center of the frame and used the 109 rear driveshaft. Everything fits pretty good. You have to watch where the shifter comes up as it is real close to the seats.I used all the stock disco outriggers with custom adapters to the serII body. I used the stock disco rear bumper, gas tank,springs, steering, etc. The radiator is a pain as it is wider than the fenders..i cut holes to make it fit. There is actually a lot of room under the hood! The Disco steering wheel and petals must be fitted to the serII bulkhead. I got rid of the ABS, AC and airbags and used the regular dual braking set up. Some of the fuel injection stuff has to go under the fenders. New mud guards must be fabricated. The engine electronics, (gems), and new electronic dash must be installed. Wiring diagram essential(CD from E-bay).The most trouble i am having is getting the gems to work. The engine immobilization will not allow starting, even with the alarm module installed. I took it to the dealer to see if they can disable all that crap.If i get it running will post some pic's. UPDATE: Land Rover Las Vegas got the GEMS to work! They put it on their factory computer set up at training school. It works fine now. Supposedly the engine immobilization is gone or "F" ed out. Last edited by moab_jeff; 03-30-2006 at 11:51 AM. Saw a Defender 100 Conversion yesterday, regaled in Tomb Raider paraphenalia. Chassis and running gear donor was a Classic Range Rover. Cab was from a 110 HC Pickup. Tub was from a 130 Double-cab HC Pickup. I didn't take a pic, but here's an approximation I devised using Photoshop (sorry, not very much like the Tomb Raider truck). Last edited by Den; 05-24-2006 at 06:12 AM.